Boertmann, D. 1990. Phylogeny of the divers, family Gaviidae (Aves). Steenstrupia 16:21-36. Carboneras, C. 1992. Family Gaviidae (Divers). In: del Hoyo J., Elliott A., Sargatal J. (eds) Handbook of the birds of the world, vol 1Lynx Edicions, Barcelona, pp 162–172. Cracraft, J. 1982. Phylogenetic relationships and monophyly of loons, grebes, and hesperornithiform birds, with comments on the early history of birds. Syst. Zool. 31:35-56. Johnsgard, P. A. 1987. Diving Birds of North America. Nebraska Univ. Press, Omaha, Nebraska. Mayr, G. 2004. A partial skeleton of a new fossil loon (Aves, Gaviiformes) from the early Oligocene of Germany with preserved stomach content. Journal of Ornithology 145(4):281-286. McKitrick, M. C. 1991. Forelimb myology of loons (Gaviiformes), with comments on the relationship of loons and tubenoses (Procellariiformes). Zool. J. Linnean Soc. 102:115-152. Roselaar, C. S., T. G. Tineke, M. Aliabadian, and V. Nijman. 2006. Hybrids in divers (Gaviiformes). Journal of Ornithology 147(1):24-30. 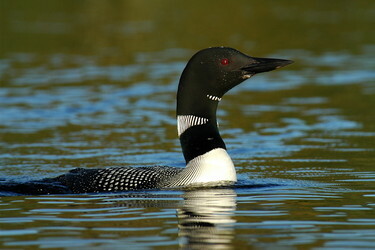 Adirondack Cooperative Loon Program (ACLP). Page: Tree of Life Gaviiformes. Gaviidae. Loons. The TEXT of this page is licensed under the Creative Commons Attribution-NonCommercial License - Version 3.0. Note that images and other media featured on this page are each governed by their own license, and they may or may not be available for reuse. Click on an image or a media link to access the media data window, which provides the relevant licensing information. For the general terms and conditions of ToL material reuse and redistribution, please see the Tree of Life Copyright Policies.